This year, has been the year of the Grinch! We love the Grinch in our household. We saw the live Boch Grinch Broadway type show this year and I even got my first Grinch sweater. 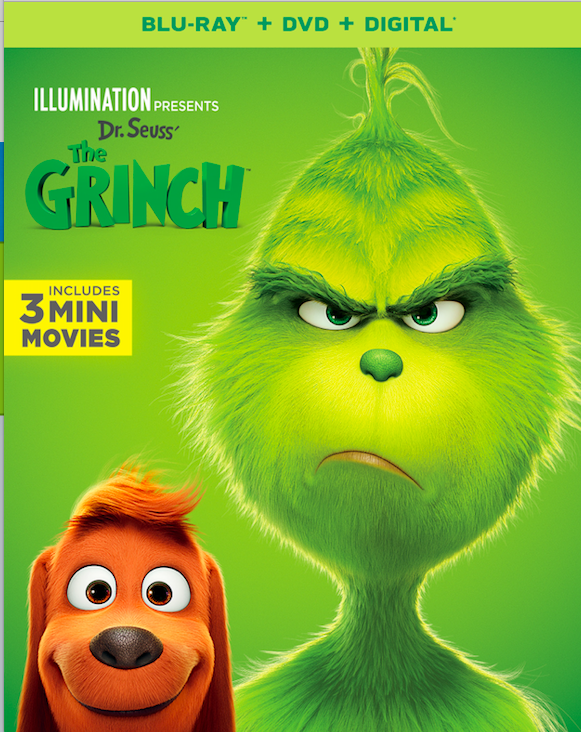 Now just in time for the coldness of the winter, Universal Pictures Home Entertainment Dr. Seuss’ The Grinch is available on DVD starting this Tuesday! Wahoo! Be sure to pick up this wonderful movie on DVD on February 5th! Also available now for streaming. Giveaway: One winner will receive a digital code for the Grinch. This giveaway is run via rafflecopter so click read more to see the actual giveaway. The only mandatory entry is to tell me who you want to win this for in the comment section proceeding this post. While the other entries are optional, I highly suggest filling them out to increase your chances of winning. US only. Good luck! I’d love to win because I haven’t seen it yet. I’d like to win this for my family because we haven’t seen it yet and we are huge Benedict Cumberbatch fans. I would love to win this movie so I can watch it with my niece. She loves everything Dr. Seuss related. The Grinch is one of my favorite characters, especially when played by Jim Carrey. I would love to win so I can watch this with my kids! I’d like to win because I didn’t get the chance to see the movie in theaters and it looks like a fun movie. I would love to win this for my two children – I think they would love it! I would love to win this because it looks really good and we haven’t seen it yet! My kids would definitely enjoy watching it with me. I like movies that the kids in my family can watch when they visit and stuff. Thanks so much. I loved the last Grinch movie with Jim Carrey. I want to win this to see what new take they have done on The Grinch. I want to win so I can watch with my family! I would love to win because I’m a huge fan of the Grinch and I’ve been want to see this movie ever since I seen the previews back in October. My family absolutely loves the story of the Grinch. I would really like to win this movie for them so we can watch it together during our weekly family movie night. I want to win because this movie looks great and my whole family wants to see it. I want to win for my daughter. She loves watching the Grinch movies. I like watching Grinch movies and this one looks great. I’d like to win this for my grandkids. I would like to win because I would like to watch this with my family. It looks like a very cute movie! This is my favorite version of the Grinch and I would love to add it to my video library so I can watch it with the family every Christmas! Thank you for the chance to win! After seeing the commercials on TV for this funny movie, I want to watch it with my whole family. I want to win because I want to see this movie. I would get this for my boy. I would like to add this movie to my movie collection. I love the Grinch and would love the chance to watch this with my family. I love The Grinch and I’d love to see this new one! I would like to win to watch it with my niece. I’d love to win this to watch it with my family. We want to win for our granddaughter. I want to win so I can watch it with my niece. I would like to win this because we like the Grinch and Max. I would like to win because my 2 daughters would enjoy watching this movie! I would like to win because we haven’t seen this movie yet. We have not seen this and we would like to see it. I would love to win this for my littles! They loved the movie when they saw it! I want to win so that I can watch the Grinch with my grandchild. should complete ce online, according to the specific area of study. area which has the correct forms so you can get government college grants. “I also desired to possess a more unified University experience with the type available here, instead of to become at a London university using scattered campuses. Stafford Loan Eligibility To be qualified to receive a Stafford loan you need to develop a Free Application for Federal Student Aid (FAFSA).